Steve has been with Experian for 10 years transitioning through various roles in B2B. 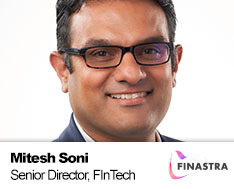 He has led various initiatives including the development Mitesh Soni is a Senior Director of Innovation and Fintech at Finastra, the world’s third largest financial technology company. He is a global banking industry expert with more than 20 years’ experience driving business transformation, digital disruption, and business model redefinition. He has spent a number of years in the risk management and trading technologies space holding a Financial Risk Manager qualification from the Global Association of Risk Managers.